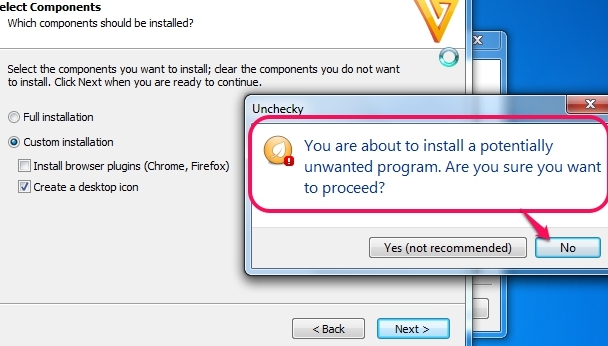 Unchecky (beta) is a handy software that is used to automatically uncheck third party adware that are offered to you while installing a particular software (known as adware or ad-supported software). It is quite helpful as you don’t need to manually select advanced (or custom) installation and uncheck the check box of third-party products to ignore their installation. It automatically selects custom installation for you and uncheck extra tools installation options, as highlighted in screenshot below. Not only this, it will keep desktop shortcut option enabled for you of that particular software that you want to install. Hence, it is quite useful for all users. Note: Unchecky is also helpful in cases when you will be offered extra tools in which you have to select ‘I do not accept‘ option in order to skip extra tools installation. That installation page will be skipped automatically. But for some cases, when a software is installed with the help of an installer (like CNet Installer), you have to manually click Decline button to ignore extra tools. Mostly, we remain in a hurry while installing a software, and just click next buttons and go through full installation process. As a result of which, extra tools are also installed that we have to remove manually later. This results in wastage of time as well as some changes in settings or in homepage of web browsers. But using Unchecky, it will be so easy to ignore extra tools even if you are in hurry. It automatically selects custom installation for you whenever you will try to install an ad-supported software. It will also uncheck third-party software installation options automatically. One of the lightweight software. Set up file is just 394 KB. How To Use Unchecky To Automatically Uncheck Third Party Software While Installing a Software? 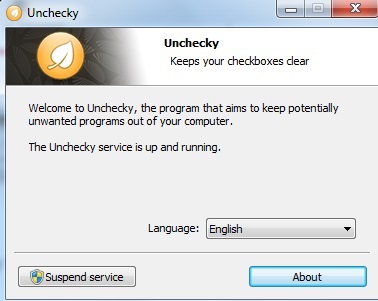 Download Unchecky to your PC and install it. You can find the download link at the end of this article. After completing the installation, run it. You should run it as administrator for good results. It provides a very simple interface where you can simply select a suitable language for you and can enable/disable Unchecky. PC restart might be required if you turn on Unchecky again, after suspending it. Now whenever you will install a software (no matter whether you know that the software is adware or not), it will automatically enable custom installation mode, and will uncheck extra tools (if any). As I mentioned before, it will also skip extra tools in which you have to select “I accept”/ “I do not accept” option during installation process. Check this software to auto install applications without any user interaction. Unchecky is really useful and unique software of its own kind. It will help to ignore third-party software installation. It works quite fine even in beta version. As an improvement, it should be run in system tray when not in use. We have also reviewed 4 free software to update installed software automatically.